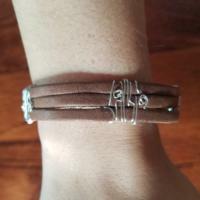 Details: Wrap silver wire on a pre-made, three-strap leather bracelet with a snap closure. Using jewelry tools like pliers, hammers, and anvils, students will crimp and shape waves, curls, and decorative patterns on their leather bracelet. Creativity & Cocktails is a rotating series of fun and approachable art experiences. Participants learn and work while sipping on fun cocktails (age 21+) from the Center bar.